The use of simple games for marketing purposes. The use of new ways of personalized advertising in a world of ad-blockers. New ways to engage with users. -No coding or serious programming were used in this project (Graphical, click philosophy). 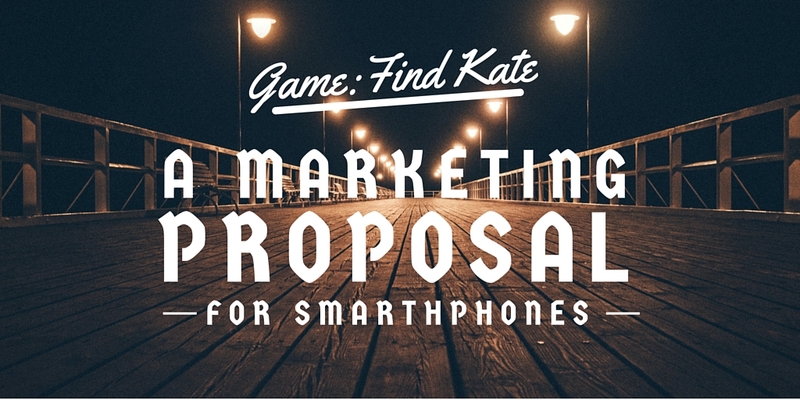 Find Kate is a project created to explore the use of games for marketing purposes. This project started after the confirmation of a curious behavior. A huge amount of users that buy online makes their purchases through mobile devices. This may not seem very reasonable, you can´t make good comparatives since a phone or get extra important information with ease. However, customers are not as reasonable as we may believe, and so, in marketing, we have to pay attention to the details to empathize with the user. People purchase products with their phones because it’s the best moment for them. They are bored in the bus after a hard day of work, and they like to do impulsive low-value acquisitions. Is a way of distraction, as play angry birds or read a blog. Of course, the bus is just one example of many situations, but it reflects a documented trend. This brings us to the need to attract this segment of users. One of the ideas that is been exploited right now is to add ads on websites and games. This is ads are usually not controlled by the seller, but by an intermediary, and the typical result is annoying ads that users try to block. As an alternative situation, the idea of a game for marketing purposes is to give value to the customers. Instead of blocking with adds the content users want to see, you give it to them. And in a not disturbing place, you allow them to easily visit a selection product of your shop. HJ-story is a 4 years old webcomic. The author creates stories with sweet characters and gets profits by selling books, postcards and phone cases of the characters. For my marketing proposal, I made a game based on a 16 dollars construct 2 template. Then I replace the images for one of the latest publications of the webcomic. Later I worked on adding an extra button that opens the HJ-story online shop. Luckily Construct 2 is a painless program. You do not need to program or to see coding. A few hours of observation on how the template works and to read documentation was all I needed. Finally, with the online software Monaca, I tested and prepared the game to be ready for publishing on the app stores. In my case, and thanks to my previous knowledge, 16 dollars and two days of work was what it was needed for developing the minigame. A great cost-effective project in comparison with the effort of making any simple website. Note: Publishing a game in the app stores is not free. Google demands 25 dollars for a nonexpiring license and Apple a 99 annual license. We saw in many articles how technology barriers are falling fast. This is is not something that is going to stop. Amazing videos or impressive promotional images are something accessible to anyone with a laptop. Therefore the fight for users attention is getting harder. If we want to win it we have to continue innovating, analyze user preferences and propose new ideas so users really can enjoy our marketing campaign and desire to share it.